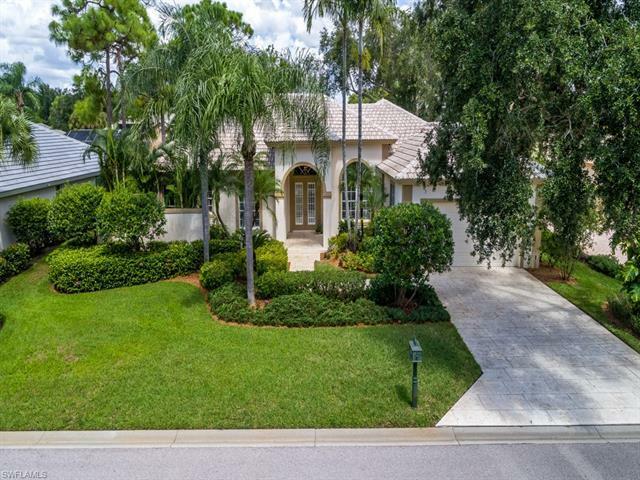 3490 Fiddlehead Ct, Bonita Springs, FL.| MLS# 218063768 | Southwest Florida Residential Real Estate for Sale. H.13608 - Imagine sitting on your private lanai, gazing over the sparkling pool, making relaxation your top priority. This 3 bedroom, 2 Â½ bath , plus den immaculate home, with soaring ceilings, open floor plan, is designed for comfort, convenience and perfect for entertaining. The home has a formal living and dining room as well as an open, spacious gourmet kitchen with Viking appliances, which overlooks the bright family room enhancing your everyday enjoyment. The two comfortable guest bedrooms are perfect for entertaining extended family and friends. The large Master suite features his/hers walk-in closets, updated oversized bath with a walk-in shower, separate vanities and a generous sized tub to relax in. Pelican Landing is an amenity rich gated community offering extensive variety of amenities such as a 34 acre island beach part accessible by a community boat shuttle, state of the art fitness center, bocce ball, championship tennis facility, pickle ball, canoe/kayak parks, and more, all for a very low HOA fee. Season is just around the corner, donât miss your chance to view this one-of-a-kind property, and secure your special spot, in all that Southwest Florida has to offer!